From 1992-1997 I taught 9th grade world geography and served as foreign student college adviser/guidance counselor at the NEHS Bilingual School, the "earlier-version" of IBSH, and understand the high standards of the community. Now, from the US, my professional, committed team of teachers delivers high-quality English instruction and a "pipeline to America" via the Internet. We are excited to offer a summer slate of courses on July 7, and wanted to share this exciting information with as many IBSH families as possible, so we can help as many people as possible. We help students with vocabulary, writing, reading comprehension, SAT prep, and overall "keeping in touch with daily life in America." In particular, many parents say "we need extra help with writing." This summer we are DELIGHTED to host a MIDDLE SCHOOL WRITING BOOT CAMP, July 7-Aug. 14. The class is small, and only 4 spots are left. Details are below, plus the link to the class description page. We offer small group classes plus 1 on 1 English coaching during the summer and school year. Program Description: This six-week intensive program, based upon the proven principles from the Institute for Excellence in Writing, helps middle school students develop the skills to become effective writers who can handle a variety of writing tasks, such as persuasive, descriptive, narrative, and others. Special attention will focus on helping students organize their thoughts and essays, choose the right word, use correct grammar, cut clutter, and be crystal clear. During the 24 sessions, students will receive direct writing and vocabulary instruction, be assigned writing assignments to do at home, and receive real-time, individualized feedback in class to become master writers. Read the classic novel The Man Who Moved a Mountain, about a man who changed his whole 1920's community in Southwest Virginia for the better. As an added bonus, our class is coming to you from the mountains of Southwest Virginia, so students can gain valuable insights into local history. Each year, there are new teachers joining the IBSH teaching force. Our parents have been the welcome wagon to help host the new teachers and assist in their transition to Taiwan. 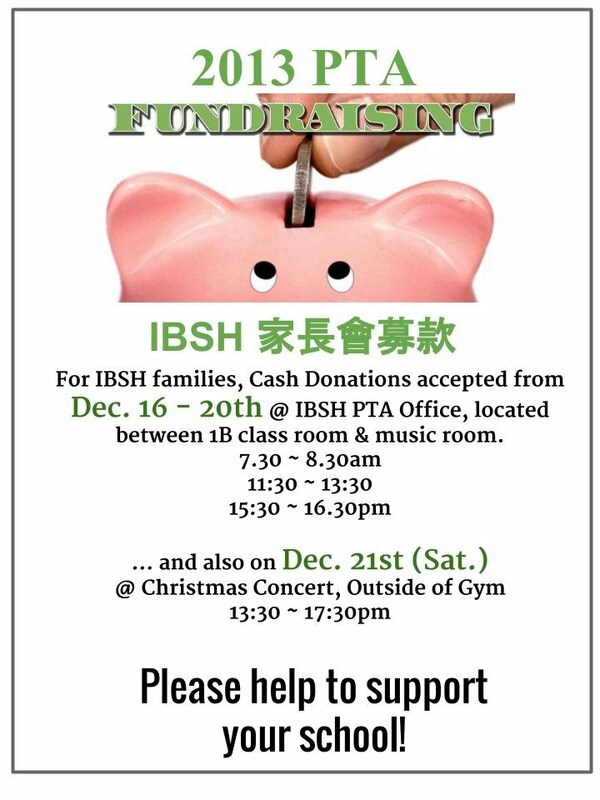 This year, PTA has further formalized the hosting process, making the summer event not only a more enjoyable occasion for the new additions to the IBSH community but also a better planed process to the hosting parents. To further assist in making the transition a more pleasant one for new teachers and new families alike, PTA has put together a "survival guide" to help the new comers settle in their lives around IBSH and the Science Park. Please open the most recently updated information package, where you can find pretty much everything from opening bank accounts, visiting hospital, to bus routes that take you to various destinations, and much more. Our goal is to enhance the educational experience for IBSH's students. We believe that being involved in our school's community leads to higher rewards for our children. How does the PTA help our children? In our school, we fund and organize activities and events that benefit our children at school, at home, and in our community.